Last Friday, the Ted Crow Challenge commenced. Today, it comes to its conclusion. The next morning, as he rolled up his pant legs, I told him I could go buy him some real bike gear. 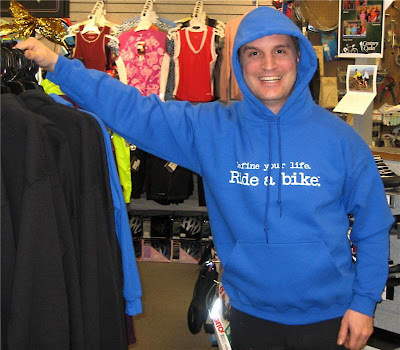 "They have all sorts of cool, high-tech outfits at Century Cycles! I could run out at lunch time!" I told him earnestly. "Nah, I’m not an outfit kind of guy," he said, pulling on a second sweat shirt. "Besides, it leaves more money for nice Kimmy outfits." We agreed with Kim. Century Cycles could help. We tried to prove Ted could be an outfit kind of guy (for comfort, for safety, and -- we'll admit it -- to look good). When we took The Ted Crow Challenge, we tapped a wealth of great knowledge among the Century Cycles staff. Lots of folks chimed in with ideas, like Ken in Rocky River, who recommended "definitely Pearl Izumi AmFIB Tights!" "Something smuzzy!" said Petch. That would be this Pearl Izumi Kodiak Light Long Sleeve Jersey ($79.99). "Smuzzy" is Petch-speak for "cold-weather comfort and warmth," especially when teamed up with Pearl Izumi Phase Tights ($54.99) and Pearl Izumi Vagabond R3 shoes ($84.99). So we had a lot of fun with The Ted Crow Challenge. We hope Ted and Kim Crow did, too. Many thanks to them for being such good sports. We wish them a great holiday season, with hopefully a few good cycling outfits for Ted -- and lots of nice Kimmy outfits, too! Tom, that is some hot stuff!